Displaying XML data is rather simple. HTML browsers understand XML too. 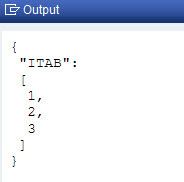 DATA itab TYPE TABLE OF i WITH EMPTY KEY. itab = VALUE #( ( 1 ) ( 2 ) ( 3 ) ). cl_abap_browser=>show_xml( xml_xstring = xml ). cl_abap_browser=>show_xml( xml_xstring = json ). Works, but JSON is displayed simply as an unformatted text string. To get a formatted output, for test cases you can use CL_DEMO_OUTPUT. The big but: CL_DEMO_OUTPUT is not intended for productive usage. You can use the XSL transformation SJSON2HTML in order to transform JSON to formatted HTML and use this with a browser. Even interactive. Maybe not perfect but at least something. SJSON2HTML is available in release 7.02 already. Thanks for the sharing this trick. TYPES: ref TYPE REF TO if_demo_output. NEXT out = out->write_json( i ) ). if you want to iterate 4 times. But you must feed JSON to write_json.